The mechanisms and severity of sports-related lumbar spinal injuries reflect a competitive and risk-taking culture. [3, 4, 5, 6, 7, 8] Lumbar spine bony injuries are often limited to specific sports, most frequently seen in sports such as automobile or motorcycle racing, [9, 10, 11] skydiving  (see the image below), power weight lifting, [13, 14] wrestling,  gymnastics, [16, 17, 18] football, [19, 20, 21, 22, 23, 24] hockey,  rowing,  horseback riding, [27, 28] and high-speed snow sports. [29, 30, 31, 32, 33] This article reviews the diagnosis and management of acute lumbar vertebral fractures. Sagittal computed tomography scan reconstruction of a young female who had a skydiving accident. The parachute deployed, but the patient landed on concrete and sustained a lower-extremity fracture and a fracture of L1. She was neurologically intact but required an open reduction with a fusion and instrumental fixation of the fracture. For excellent patient education resources, see eMedicineHealth's patient education articles Vertebral Compression Fracture and Low Back Pain. The epidemiology of thoracic and lumbar spine injuries in athletes is very difficult to document. Most epidemiologic studies on lumbar spine injuries in athletes lack prospective data. The thoracolumbar junction and lumbar spine are common sites for fractures due to the high mobility of the lumbar spine compared with the more rigid thoracic spine. Injury to the cord or cauda equina occurs in approximately 10-38% of adult thoracolumbar fractures and in as many as 50-60% of fracture dislocations. The rate of bony injury without neurologic consequence is undoubtedly higher. Information on the incidence of sports-related spinal injuries in other countries is also limited and difficult to determine due to differences in data collection and reporting among countries. In England, Williams estimated that spinal injuries accounted for 15% of all injuries sustained in sports. Furthermore, injuries to the thoracic and lumbar spine seemed to be more frequent in automobile racing, horseback riding, parachuting, mountain climbing, and weightlifting. The lumbar spine must transmit compressive, bending, and twisting forces that are generated between the upper and lower body. Consequently, as one moves more caudally into the lumbar spine, the muscle groups and ligaments become larger and stronger. The intervertebral discs consist of 2 components, the annulus fibrosus and the nucleus pulposus. The annulus is a dense fibrous ring located at the periphery of the disc, which has strong attachments to the vertebrae and serves to confine the nucleus pulposus. The lumbar spine is surrounded by powerful musculature and ligaments, which dynamically stabilize the spine. The lumbar spine is a complex, 3-dimensional (3-D) structure that is capable of flexion, extension, lateral bending, and rotation. In the spine, the total range of motion is the result of a summation of the limited movements that occur between the individual vertebrae. Strong muscles and ligaments are crucial for supporting the bony structures and for initiating and controlling movement. The most common movement of the lumbar spine is flexion. During flexion, anterior compression of the intervertebral disc and widening of the spinal canal occurs along with some sliding movement of the articular process in the zygapophyseal joint. This movement is limited by the posterior ligamentous complex and the dorsal muscles. Extension of the lumbar spine is more limited, producing posterior compression on the disc, narrowing of the spinal canal, and a sliding motion of the zygapophyseal joint. The anterior longitudinal ligament, ventral muscles, lamina, and spinous processes limit the extension of the lumbar spine. Lateral bending involves lateral compression of the intervertebral disc, along with sliding separation of the zygapophyseal joint on the convex side. An overriding of the zygapophyseal joint occurs on the concave side. The intertransverse ligaments limit the lateral bending of the spine. Rotation of the lumbar spine involves compression of the annulus fibrosus fibers. It is limited by the geometry of the facet joints and the iliolumbar ligaments. The motion of the lumbar spine cannot be considered without evaluating the synchronous movements of the cervical and thoracic spine. The entire spinal column moves as one unit in all planes of motion. Each region of the spine has its own characteristic curvature. These curves allow an upright posture while maintaining the center of gravity over the pelvis and lower limbs. Although most rotation is accomplished at the cervical spine, flexion and lateral bending are primarily cervical and lumbar functions. Spinous process fractures may occur as a result of direct trauma to the posterior spine or as a result of forcible flexion and rotation. These injuries are usually not associated with neurologic deficits. Violent muscular contraction or direct trauma can cause fractures of the transverse processes. For example, a football helmet blow to the back can cause fractures of either the spinous or transverse processes. 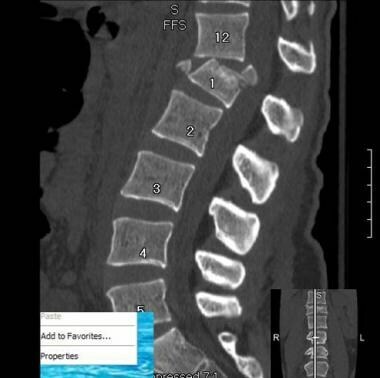 Burst fractures (see the images below) are usually associated with axial loading and compression of the spine. Acute traumatic spondylolisthesis is usually associated with major trauma and extreme hyperextension of the spine. Sagittal T1-weighted magnetic resonance imaging study of a professional driver who was in a rollover motor vehicle accident while racing his car. 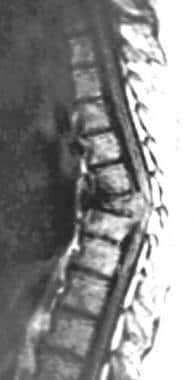 This figure shows a T-10 unstable burst fracture producing severe kyphotic deformity of the spine. The abnormal signal on the vertebral body and the extradural defect represents a subacute hematoma producing spinal cord compression. The patient had severe paraparesis and underwent an emergency operation. The procedure involved an anterolateral retroperitoneal approach with a corpectomy and vertebral reconstruction. Postoperative plain x-ray film of a professional driver who experienced a burst fracture in a rollover motor vehicle accident while racing his car. 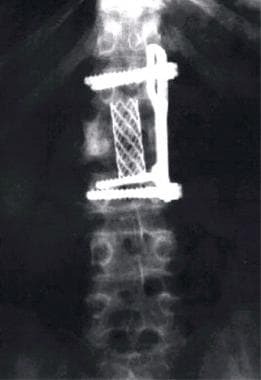 This image shows a vertebral reconstruction with the use of a titanium cage filled with bone and the arthrodesis with a Z plate. Sagittal computed tomography scan reconstruction of an athlete who had a burst fracture. The intervertebral discs are thick and strong. The annulus fibrosus receives most of the forces that are transmitted from one vertebral body to another, and it is designed to resist tension and shearing forces. The nucleus pulposus is designed to resist compression forces; it receives primarily vertical forces from the vertebral bodies and redistributes them in a radial fashion to the horizontal plane. This structure allows the intervertebral discs to dissipate the axial loading. Konan LM,. Lumbosacral, Acute Bony Injuries. Mesfin FB. StatPearls. October 9, 2017. Treasure Island (FL): StatPearls Publishing; 2018 Jan. [Full Text]. Marek AP, Morancy JD, Chipman JG, Nygaard RM, Roach RM, Loor MM. Long-Term Functional Outcomes after Traumatic Thoracic and Lumbar Spine Fractures. Am Surg. 2018 Jan 1. 84 (1):20-27. [Medline]. [Full Text]. Jones A, Andrews J, Shoaib A, et al. Avulsion of the L4 spinous process: an unusual injury in a professional rugby player: case report. Spine. 2005 Jun 1. 30(11):E323-5. [Medline]. Tator CH, Provvidenza CF, Lapczak L, Carson J, Raymond D. Spinal injuries in Canadian ice hockey: documentation of injuries sustained from 1943-1999. Can J Neurol Sci. 2004 Nov. 31(4):460-6. [Medline]. Hickey GJ, Fricker PA, McDonald WA. Injuries of young elite female basketball players over a six-year period. Clin J Sport Med. 1997 Oct. 7(4):252-6. [Medline]. Halvorsen TM, Nilsson S, Nakstad PH. [Stress fractures. Spondylolysis and spondylolisthesis of the lumbar vertebrae among young athletes with back pain] [Norwegian]. Tidsskr Nor Laegeforen. 1996 Jun 30. 116(17):1999-2001. [Medline]. Bennell KL, Malcolm SA, Thomas SA, et al. Risk factors for stress fractures in female track-and-field athletes: a retrospective analysis. Clin J Sport Med. 1995 Oct. 5(4):229-35. [Medline]. Ekin JA, Sinaki M. Vertebral compression fractures sustained during golfing: report of three cases. Mayo Clin Proc. 1993 Jun. 68(6):566-70. [Medline]. Stanislas MJ, Latham JM, Porter KM, Alpar EK, Stirling AJ. A high risk group for thoracolumbar fractures. Injury. 1998 Jan. 29(1):15-8. [Medline]. Ryan M, Klein S, Bongard F. Missed injuries associated with spinal cord trauma. Am Surg. 1993 Jun. 59(6):371-4. [Medline]. Williams B. Pathogenesis of post-traumatic syringomyelia. Br J Neurosurg. 1992. 6(6):517-20. [Medline]. Browne TD, Yost RP, McCarron RF. Lumbar ring apophyseal fracture in an adolescent weight lifter. A case report. Am J Sports Med. 1990 Sep-Oct. 18(5):533-5. [Medline]. Alexander MJ. Biomechanical aspects of lumbar spine injuries in athletes: a review. Can J Appl Sport Sci. 1985 Mar. 10(1):1-20. [Medline]. Snook GA. Injuries in intercollegiate wrestling. A 5-year study. Am J Sports Med. 1982 May-Jun. 10(3):142-4. [Medline]. Konermann W, Sell S. [The spine--a problem area in high performance artistic gymnastics. A retrospective analysis of 24 former artistic gymnasts of the German A team] [German]. Sportverletz Sportschaden. 1992 Dec. 6(4):156-60. [Medline]. Tewes DP, Fischer DA, Quick DC, Zamberletti F, Powell J. Lumbar transverse process fractures in professional football players. Am J Sports Med. 1995 Jul-Aug. 23(4):507-9. [Medline]. Saal JA. Common American football injuries. Sports Med. 1991 Aug. 12(2):132-47. [Medline]. Virgin HW. Football injuries to the skeletal system. Compr Ther. 1985 Jan. 11(1):19-24. [Medline]. Bowerman JW, McDonnell EJ. Radiology of athletic injuries: football. Radiology. 1975 Oct. 117(1):33-6. [Medline]. Gray BL, Buchowski JM, Bumpass DB, Lehman RA, Mall NA, Matava MJ. Disc Herniations in the National Football League. Spine (Phila Pa 1976). 2013 Sep 10. [Medline]. Nagashima M, Abe H, Amaya K, Matsumoto H, Yanaihara H, Nishiwaki Y, et al. Risk Factors for Lumbar Disc Degeneration in High School American Football Players: A Prospective 2-Year Follow-up Study. Am J Sports Med. 2013 Sep. 41(9):2059-64. [Medline]. Schroeder GD, McCarthy KJ, Micev AJ, Terry MA, Hsu WK. Performance-Based Outcomes After Nonoperative Treatment, Discectomy, and/or Fusion for a Lumbar Disc Herniation in National Hockey League Athletes. Am J Sports Med. 2013 Aug 16. [Medline]. Wilson F, Gissane C, Gormley J, Simms C. Sagittal plane motion of the lumbar spine during ergometer and single scull rowing. Sports Biomech. 2013 Jun. 12(2):132-42. [Medline]. Silver JR. Spinal injuries resulting from horse riding accidents. Spinal Cord. 2002 Jun. 40(6):264-71. [Medline]. [Full Text]. Lin CY, Wright J, Bushnik T, Shem K. Traumatic spinal cord injuries in horseback riding: a 35-year review. Am J Sports Med. 2011 Nov. 39(11):2441-6. [Medline]. Donald S, Chalmers D, Theis JC. Are snowboarders more likely to damage their spines than skiers? Lessons learned from a study of spinal injuries from the Otago skifields in New Zealand. N Z Med J. 2005 Jun 24. 118(1217):U1530. [Medline]. Basu S, Makwana NK, Khazim R. Sledging related spinal injuries and fracture patterns: a report on five cases. Br J Sports Med. 1999 Oct. 33(5):357-8; discussion 359. [Medline]. [Full Text]. Okamoto K, Doita M, Yoshikawa M, et al. Lumbar chance fracture in an adult snowboarder: unusual mechanism of a chance fracture. Spine. 2005 Jan 15. 30(2):E56-9. [Medline]. Keene JS. Thoracolumbar fractures in winter sports. Clin Orthop Relat Res. 1987 Mar. 216:39-49. [Medline]. Roberts VL, Noyes FR, Hubbard RP, McCabe J. Biomechanics of snowmobile spine injuries. J Biomech. 1971 Dec. 4(6):569-77. [Medline]. Snook GA. A review of women's collegiate gymnastics. Clin Sports Med. 1985 Jan. 4(1):31-7. [Medline]. Eismont FJ, Kitchel SH. Thoracolumbar spine. Delee JC, Drez D, eds. Orthopedic Sports Medicine: Principles and Practice. Philadelphia, Pa: WB Saunders Co; 1994. Vol 2: 1018-62. Denis F. The three column spine and its significance in the classification of acute thoracolumbar spinal injuries. Spine. 1983 Nov-Dec. 8(8):817-31. [Medline]. Denis F. Spinal instability as defined by the three-column spine concept in acute spinal trauma. Clin Orthop Relat Res. 1984 Oct. 189:65-76. [Medline]. Magerl F, Aebi M, Gertzbein SD, Harms J, Nazarian S. A comprehensive classification of thoracic and lumbar injuries. Eur Spine J. 1994. 3(4):184-201. [Medline]. Rahme R, Moussa R. The modic vertebral endplate and marrow changes: pathologic significance and relation to low back pain and segmental instability of the lumbar spine. AJNR Am J Neuroradiol. 2008 May. 29(5):838-42. [Medline]. [Full Text]. Bochkezanian V, Newton RU, Trajano GS, Blazevich AJ. Effects of Neuromuscular Electrical Stimulation in People with Spinal Cord Injury. Med Sci Sports Exerc. 2018 Apr 9. [Medline]. Lieberman JA, Lyon R, Feiner J, Hu SS, Berven SH. The efficacy of motor evoked potentials in fixed sagittal imbalance deformity correction surgery. Spine. 2008 Jun 1. 33(13):E414-24. [Medline]. Lavelle WF, Lavelle ED, Smith HS. Interventional techniques for back pain. Clin Geriatr Med. 2008 May. 24(2):345-68, viii. [Medline]. Korovessis P, Baikousis A, Zacharatos S, et al. Combined anterior plus posterior stabilization versus posterior short-segment instrumentation and fusion for mid-lumbar (L2-L4) burst fractures. Spine. 2006 Apr 15. 31(8):859-68. [Medline]. Bailes JE Jr, Van der Veer CA. Surgical management of patients with sports-related spinal injuries. Clin Neurosurg. 2001. 48:243-59. [Medline]. Razak M, Mahmud M, Mokhtar SA, Omar A. Thoracolumbar fracture--dislocation results of surgical treatment. Med J Malaysia. 2000 Sep. 55 suppl C:14-7. [Medline]. Denis F, Burkus JK. Shear fracture-dislocations of the thoracic and lumbar spine associated with forceful hyperextension (lumberjack paraplegia). Spine. 1992 Feb. 17(2):156-61. [Medline]. Karjalainen M, Aho AJ, Katevuo K. Operative treatment of unstable thoracolumbar fractures by the posterior approach with the use of Williams plates or Harrington rods. Int Orthop. 1992. 16(3):219-22. [Medline]. Dai LY. Remodeling of the spinal canal after thoracolumbar burst fractures. Clin Orthop Relat Res. 2001 Jan. 382:119-23. [Medline]. Denis F, Burkus JK. Diagnosis and treatment of cauda equina entrapment in the vertical lamina fracture of lumbar burst fractures. Spine. 1991 Aug. 16(8 suppl):S433-9. [Medline]. Denis F, Burkus JK. Lateral distraction injuries to the thoracic and lumbar spine. A report of three cases. J Bone Joint Surg Am. 1991 Aug. 73(7):1049-53. [Medline]. [Full Text]. Riggins MS, Kankipati P, Oyster ML, Cooper RA, Boninger ML. The relationship between quality of life and change in mobility 1 year postinjury in individuals with spinal cord injury. Arch Phys Med Rehabil. 2011 Jul. 92(7):1027-33. [Medline]. Marino RJ, Burns S, Graves DE, Leiby BE, Kirshblum S, Lammertse DP. Upper- and lower-extremity motor recovery after traumatic cervical spinal cord injury: an update from the national spinal cord injury database. Arch Phys Med Rehabil. 2011 Mar. 92(3):369-75. [Medline]. Abel MS. Jogger's fracture and other stress fractures of the lumbo-sacral spine. Skeletal Radiol. 1985. 13(3):221-7. [Medline]. Aharony S, Milgrom C, Wolf T, et al. Magnetic resonance imaging showed no signs of overuse or permanent injury to the lumbar sacral spine during a Special Forces training course. Spine J. 2008 Jul-Aug. 8(4):578-83. [Medline]. Benzel EC, Larson SJ. Postoperative stabilization of the posttraumatic thoracic and lumbar spine: a review of concepts and orthotic techniques. J Spinal Disord. 1989 Mar. 2(1):47-51. [Medline]. Breitenfelder J. [Treatment of fractures of the vertebral body without involvement of the spinal cord or roots] [German]. Z Orthop Ihre Grenzgeb. 1972 Feb. 110(1):116-20. [Medline]. Bötel U. [Classification and surgical indications in spinal injuries] [German]. Langenbecks Arch Chir Suppl Kongressbd. 1992. 263-70. [Medline]. Centenera LV, Choi S, Hirsch JA. Percutaneous vertebroplasty treats compression fractures. Diagn Imaging (San Franc). 2000 Nov. 22(11):147-8, 153. [Medline]. Clark JE. Apophyseal fracture of the lumbar spine in adolescence. Orthop Rev. 1991 Jun. 20(6):512-6. [Medline]. Csermely T, Halvax L, Schmidt E, et al. [Lower bone density (osteopenia) in adolescent girls with oligomenorrhea and secondary amenorrhea] [Hungarian]. Orv Hetil. 1997 Oct 26. 138(43):2735-41. [Medline]. Dennis S, Watkins R, Landaker S, Dillin W, Springer D. Comparison of disc space heights after anterior lumbar interbody fusion. Spine. 1989 Aug. 14(8):876-8. [Medline]. Ferrandez L, Usabiaga J, Curto JM, Alonso A, Martin F. Atypical multivertebral fracture due to hyperextension in an adolescent girl. A case report. Spine. 1989 Jun. 14(6):645-6. [Medline]. Garth WP Jr, Van Patten PK. 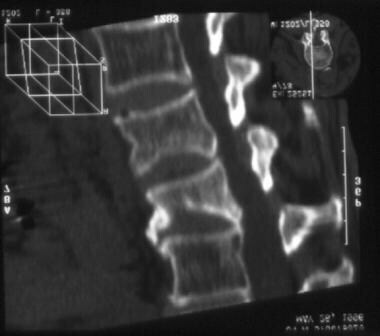 Fractures of the lumbar lamina with epidural hematoma simulating herniation of a disc. A case report. J Bone Joint Surg Am. 1989 Jun. 71(5):771-2. [Medline]. [Full Text]. Greenan TJ. Diagnostic imaging of sports-related spinal disorders. Clin Sports Med. 1993 Jul. 12(3):487-505. [Medline]. Hakalo J, Wronski J. [Complications of a transpedicular stabilization of thoraco-lumbar burst fractures] [Polish]. Neurol Neurochir Pol. 2006 Mar-Apr. 40(2):134-9. [Medline]. Haussler KK, Stover SM. Stress fractures of the vertebral lamina and pelvis in Thoroughbred racehorses. Equine Vet J. 1998 Sep. 30(5):374-81. [Medline]. Hopkins TJ, White AA 3rd. Rehabilitation of athletes following spine injury. Clin Sports Med. 1993 Jul. 12(3):603-19. [Medline]. Hulkko A, Orava S. Diagnosis and treatment of delayed and non-union stress fractures in athletes. Ann Chir Gynaecol. 1991. 80(2):177-84. [Medline]. Jeanneret B, Gebhard JS, Magerl F. Transpedicular screw fixation of articular mass fracture-separation: results of an anatomical study and operative technique. J Spinal Disord. 1994 Jun. 7(3):222-9. [Medline]. Kahler RJ, Knuckey NW, Davis S. Arachnoiditis ossificans and syringomyelia: a unique case report. J Clin Neurosci. 2000 Jan. 7(1):66-8. [Medline]. Keynan O, Fisher CG, Vaccaro A, et al. Radiographic measurement parameters in thoracolumbar fractures: a systematic review and consensus statement of the Spine Trauma Study Group. Spine. 2006 Mar 1. 31(5):E156-65. [Medline]. Knop C, Fabian HF, Bastian L, Blauth M. Late results of thoracolumbar fractures after posterior instrumentation and transpedicular bone grafting. Spine. 2001 Jan 1. 26(1):88-99. [Medline]. Kösling S, Dietrich K, Steinecke R, Klöppel R, Schulz HG. Diagnostic value of 3D CT surface reconstruction in spinal fractures. Eur Radiol. 1997. 7(1):61-4. [Medline]. Levi AD, Hurlbert RJ, Anderson P, et al. Neurologic deterioration secondary to unrecognized spinal instability following trauma--a multicenter study. Spine. 2006 Feb 15. 31(4):451-8. [Medline]. Massari L, Chiarelli GM, Lupi L, Bighi S. Fractures of the posterior apophyseal ring of the lumbar vertebral body in young patients. Three cases. [English, Italian]. Chir Organi Mov. 1990 Apr-Jun. 75(2):129-33. [Medline]. Matejka J. [Hyperextension injuries of the thoracolumbar spine] [German]. Zentralbl Chir. 2006 Feb. 131(1):75-9. [Medline]. Mazel C. [Spondylolisthesis in athletes] [French]. Presse Med. 1991 Apr 6. 20(13):596-600. [Medline]. Moller A, Hasserius R, Besjakov J, Ohlin A, Karlsson M. Vertebral fractures in late adolescence: a 27 to 47-year follow-up. Eur Spine J. 2006 Aug. 15(8):1247-54. [Medline]. Nabeshima Y, Iguchi T, Matsubara N, et al. Extension injury of the thoracolumbar spine. Spine. 1997 Jul 1. 22(13):1522-5; discussion 1525-6. [Medline]. Parvataneni HK, Nicholas SJ, McCance SE. Bilateral pedicle stress fractures in a female athlete: case report and review of the literature. Spine. 2004 Jan 15. 29(2):E19-21. [Medline]. Ryan PJ, Evans P, Blake GM, Fogeman I. The effect of vertebral collapse on spinal bone mineral density measurements in osteoporosis. Bone Miner. 1992 Sep. 18(3):267-72. [Medline]. Ryan PJ, Fogelman I. Osteoporotic vertebral fractures: diagnosis with radiography and bone scintigraphy. Radiology. 1994 Mar. 190(3):669-72. [Medline]. [Full Text]. Sicard A, Lavarde G. [Treatment of fractures of the thoracic and lumbar spine without neurological complications] [French]. Presse Med. 1969 Jan 4. 77(1):5-8. [Medline]. Stavrev P. Thoracolumbar spine stabilization in fracture--dislocations. Folia Med (Plovdiv). 1994. 36(4):59-65. [Medline]. Teitz CC, Cook DM. Rehabilitation of neck and low back injuries. Clin Sports Med. 1985 Jul. 4(3):455-76. [Medline]. Tschoeke SK, Hellmuth M, Hostmann A, et al. Apoptosis of human intervertebral discs after trauma compares to degenerated discs involving both receptor-mediated and mitochondrial-dependent pathways. J Orthop Res. 2008 Jul. 26(7):999-1006. [Medline]. Van der Wall H, Magee M, Reiter L, Frater CJ, Qurashi S, Loneragan R. Degenerative spondylolysis: a concise report of scintigraphic observations. Rheumatology (Oxford). 2006 Feb. 45(2):209-11. [Medline]. [Full Text]. Vollmer DG, Gegg C. Classification and acute management of thoracolumbar fractures. Neurosurg Clin N Am. 1997 Oct. 8(4):499-507. [Medline]. Yoon SH, Miyazaki M, Hong SW, et al. A porcine model of intervertebral disc degeneration induced by annular injury characterized with magnetic resonance imaging and histopathological findings. Laboratory investigation. J Neurosurg Spine. 2008 May. 8(5):450-7. [Medline]. Lateral plain radiograph. This image shows an L3 compression fracture. A computed tomography scan with sagittal reconstructions allows better visualization of the compression fracture. Axial computed tomography scan of an athlete who had a hyperextension injury that resulted in disruption of the posterior spinal elements. This patient had compromise of the anterior and middle spinal columns, resulting in an unstable fracture. Computed tomography scanning with 3-dimensional reconstruction facilitates the assessment of some complex fractures. In this case, the patient experienced a severe compression fracture. Computed tomography scan with coronal reconstruction of an athlete who had multiple compression fractures. Magnetic resonance image of a young female with a severe unstable fracture of L4. The patient had a partial neurologic deficit and required urgent surgical fixation. Postoperative radiograph of a patient status post reduction, fusion, and internal fixation of an unstable fracture. Note that the anatomic alignment has been restored.